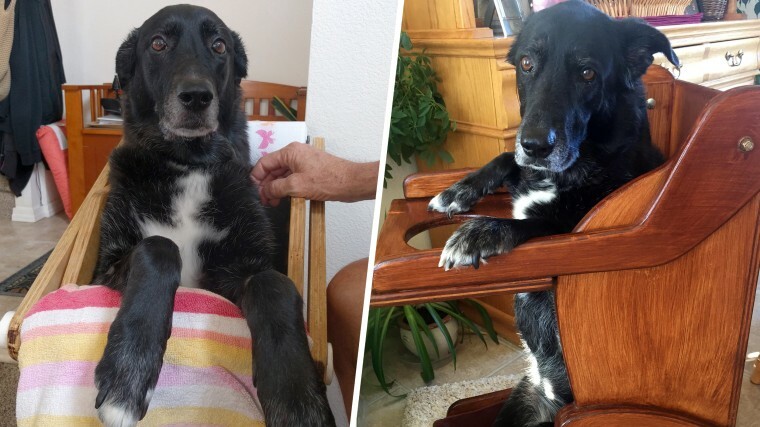 Not long ago, Daisy the dog's family worried she'd never adjust to eating and drinking in the high chair she requires due to a health condition. Daisy's high chair is specially shaped for the dog, and was built by her skilled human dad and brother, Doug and Brian Jones, respectively. It was "made with love," as Grace Jones, Daisy's human mom, told TODAY. But the Joneses didn't know if Daisy would take to her chair, no matter how lovingly crafted it was. Last summer, Daisy, who turns 10 in July, began having what seemed like respiratory problems. She was diagnosed with myasthenia gravis, an autoimmune disease, which in turn likely led to megaesophagus — that's the condition which causes her to need what's called a Bailey chair. Daisy's esophagus is enlarged, making it hard for her body to get food and water from her throat down to her stomach. Daisy's veterinarian said from the dog would have to sit in the chair every time she ate or drank from then on. So Doug and Brian Jones, who are woodworkers — Doug as a hobby, and Brian professionally — custom-built one so Daisy would be as comfortable as possible. The family worried at first that Daisy would have a difficult time adjusting. But before long Daisy was not only happily hopping into her chair all on her own, but also pulling down the tray where her food and drinks are served. "We laughed in awe because she’s so smart," Grace Jones told TODAY. "Surprised she got in the chair by herself, but even more so that she pulled down the tray and was ready to eat." Daisy and her family live in Dayton, Nevada. Grace Jones and her husband are in their 60s and retired. The couple have four adult children who "are grown and out on their own, so Daisy is the child," Jones said. They've had Daisy for more than nine years now, since she was a puppy. Someone brought Daisy to the local Dollar Tree, where the Joneses' daughter Sarah was working at the time while still in high school. The person said Daisy needed a home. Sarah, an animal lover, volunteered to take her in. "And that was it. We were in love with this cute little back puppy," Jones said. The Joneses have always enjoyed hiking, swimming and other outdoors activities — and that includes Daisy. Jones said Daisy is such "a regular 'Lassie,'" she once even led her people out of the woods when they'd gotten lost. Since Daisy's diagnosis, the Joneses have continued to do many outdoors activities as much as possible, with some safety modifications. For example, if the family is camping overnight in their recreational vehicle, they bring the chair with them. When playing around water or kayaking, Daisy may have to wear a muzzle so she doesn't try to drink from the lake or river. Daisy still loves to hike, but when it's time to rehydrate, the Joneses position her on a log in a way that'll let her drink safely. "She just stands up with her front paws on the log or rock and her back feet on the ground," Jones said. "We just try to work around her disability." Jones has found both comfort and great advice online in a Facebook group for those whose dogs share Daisy's condition. She recommends the community for others facing similar diagnoses. It's not easy making the changes that megaesophagus requires, but it's possible and it's worth trying. Mostly, though, she just feels lucky. "We have been able to manage the illness and still enjoy having Daisy with us," she said. "We love her very much."